also how the US used this to armour the wrong parts of their planes in WW2. so far so conventional. They then decided this is where planes were being hit and planned to add extra armour on those regions. 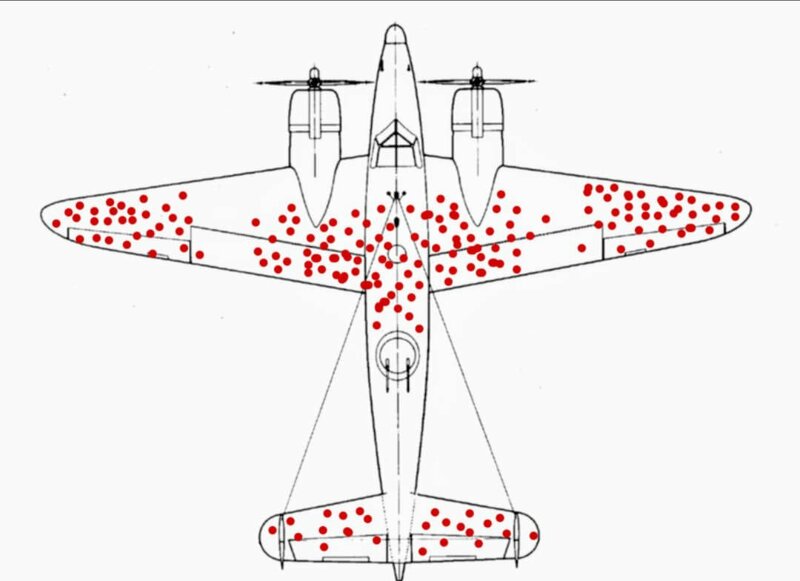 Wald (link below) disagreed and argued that the areas with the most hits were in fact the most robust part of the plane already as they could take substantial damage and the plane still survive. And as a wee bonus test ... what was the error in the original analysis? Analyzed aircraft were the ones that had survived hits to those locations. What at first seems very logical to me ends up not so much. Status: offline Thank you for sharing. And the original error, in my humble opinion, is that the only aircraft analysed where those that survived. I would suspect that the aircraft that didn't survive had damage in the areas that those that survived hadn't. In other words, the damage pattern to the destroyed aircraft would be very likely to be different than on those that survived. I have yet to follow the link and read the content, but I plan to do so in a near future. My guess as well. I notice no damage on the engines too. I would think engine damage (as well as cockpit) would be a big one for bringing a plane down. Status: offline Now give us one on why sailing in a spiral is the best way for a destroyer to find a submarine it has lost contact with. Status: online Or why, when a lion is chasing a group of people, you don't have to be the fastest runner. Or why, when a lion is chasing a group of people, you don't have to be the fastest runner. Status: offline You don't have to outrun everyone else, just the slowest person. You don't have to outrun everyone else, just the slowest person. Status: offline Some years ago a friend went on a date and the prospective couple walked through a field in which there was a bull. The girl said "I hope we can out run it"; my friend said "I only have to out run you." are we making the assumption the lion can only eat one person at a time?